Joseph (Joe) Flora, like Ernest Hemingway, was born and shaped in the American Midwest. Graduating Phi Beta Kappa in English at the University of Michigan in 1956, he knew he did not want to leave the academy and remained in Ann Arbor to earn the Ph.D. His first appointment was in the English Department at the University of North Carolina at Chapel Hill, a happy destination for a young scholar/teacher in American Literature. 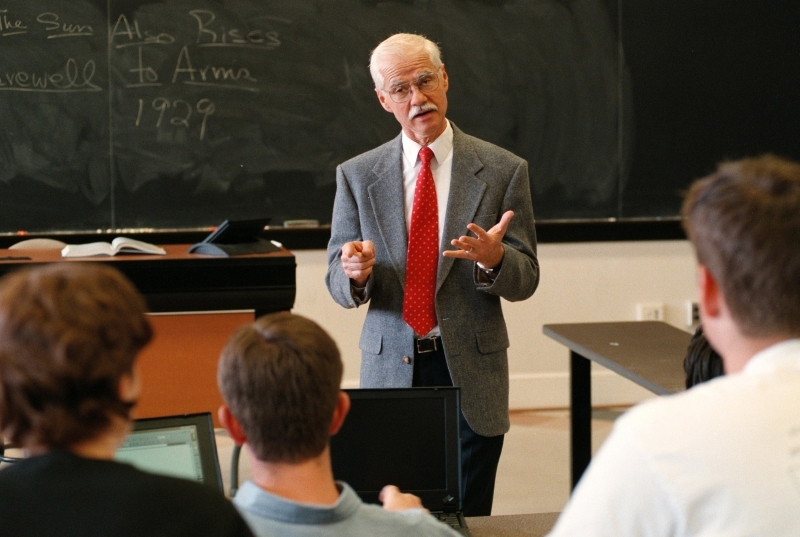 From an apprenticeship that led to his professorship, Flora was honored to serve as associate dean of the Graduate School, to chair the English Department for eleven years, to be named Atlanta Professor of Southern Culture, and later to serve as Acting Director of the Center for the Study of Study of the American South. He has twice enjoyed visiting professorships at the University of New Mexico and a visiting scholar appointment at the University of Connecticut. Flora’s scholarship embraced much of twentieth-century American literature. The West and the South figured prominently in that scholarship, as critical and reference books, numerous essays, conference presentations, and book reviews attest. The Companion to Southern Literature: Themes, Genres, Places, People, Movements, and Motifs (2002) was named Outstanding Reference Source by the American Library Association. Southern Writers: A New Biographical Dictionary received the Jules and Frances Landry Award, 2006. But the work of Ernest Hemingway was never far from Flora’s thinking, nor was the teaching of Hemingway’s work. And, as the title of Flora’s Adams Lecture suggests, it has been teaching that has provided him the most pleasure—exploring a text with bright young minds. He has loved Hemingway since discovering him as an undergraduate and has made teaching him a constant throughout his career. That teaching, of course, led to presentations at professional meetings and published essays. In addition to many articles, Flora has authored three critical Hemingway books. His Hemingway’s Nick Adams (1982) received North Carolina’s Mayflower Cup. Ernest Hemingway: A Study of the Short Fiction followed in 1989, and then Reading Hemingway’s Men Without Women (2009). As president of the Ernest Hemingway Society, Flora values the fellowship of the Hemingway community even as he keeps reading those Hemingway texts. Midwest, West, South—there are more links to explore.